1956-CHEVY, Hubcap, 15", 56-58, CHEVY, POLISHED OUTER RING, 15 BLACK PAINTED POCKETS, 6 RAISED BOWTIE, CONED CENTER, METAL SNAP RING. 1957a-PLYMOUTH, Hubcap used, 14", 57, PLYMOUTH, POLISHED OUTER RING, 63 BLACK PAINTED POCKETS, CONE TYPE, METAL CLIPS. 1958-PLYMOUTH, Hubcap used, 14", 58, PLYMOUTH, BELVEDERE, CHROME, 24 BLACK PAINTED POCKETS, CONE TYPE, METAL CLIPS. 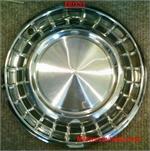 O-2, Hubcap used, 14", 60, FORD, PASSENGER, POLISHED METAL CAP, 8 RAISED SPOKES, CONE TYPE, METAL CLIPS.